Military Mapuche leader of the CAM, Hector Llaitul in prison. Military Mapuche leader of the "CAM" Héctor Llaitul arrested. CAM- Arauco Malleco Coordinating Committee. Historic leader of the CAM today confronts the justice system for the alleged ambush against prosecutor, Mario Elgueta. He was unarmed and did not resist his arrest. That is how the Investigations Police of the town of Osorno [Chile] found 41 year old Héctor Llaitul Carillanca, also known as “Commandante Héctor,” the number two man of the Arauco Malleco Coordinating Committee (CAM). The most wanted man by both uniformed police and investigations in the region was caught in Osorno, at his mother’s house, in the area of Lower Rahue. He did not in any way resist arrest and was taken to address his wounds. 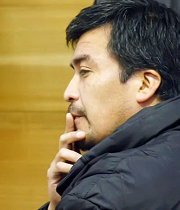 Lliatul was wanted due to an investigation by the Public Ministry (Prosecutor’s Office) that signaled him as the intellectual author of the ambush on Mario Elgueta, prosecutor specializing on the causes related to the Mapuche conflict, in October of 2008. Llaitul will be brought to court to face charges today at noon at the Bail Court in Cañete, for the crime of illicit terrorist association. Known as “Comandante Héctor,” historic leader of the Arauco Malleco Coordinating Committee is a social worker and was a member of the Manuel Rodriguez Patriotic Front [Frente Manuel Rodriguez]. Llaitul was wanted by the regional Bío-Bío Special Task Unit of the Investigations Police (PDI). He has been released since June 2008. After seven days of Oral Hearings and more than a year in prison, he was absolved of the charges for arson, illegal transport and possession of fire arms by the three judges of the Oral Court of Temuco. This because he had been accused of having led a group of hooded men and women to the estate “Las Praderas” belonging to Mininco Forestry Inc., in the area of Cholchol, in order to set fire to logging machinery, on December 26th, 2006. That day, eight people burned a truck and a pick-up belonging to a company contracted by Minico Forestry Inc. Mapuche community members of the area, forming a vigilance group stopped Roberto Carlos Painemil, another Mapuche leader, as he escaped. He was found to have two fire arms and other things, such as an automobile that made it presumed he had participated in the assault. Lliatul also went through the Concepción Court House; he was arrested on February 21st 2007 in Acevedo Plaza in the city of Concepción while he was walking peacefully. He was found to have a 9 millimeter pistol with 10 barrels and 63 bullets. He was arrested by detectives of the Theft Investigations Brigade, whom were carrying out a routine check at 1 pm. He risked a 541 day and 10 year sentence in jail, which the Public Ministry (Prosecutor’s Office) then pleaded for 5 year and a day in prison, but he only received the sentence for bail. The total amounted to $ 367 000 Chilean pesos (approx. $ 815.00 CAD). At that time, it was asked that the trial be cancelled, however to no avail. However, he was not released since he was under investigation for terrorist arson in the Ninth Region of southern Chile. Before then, he was arrested in the town of Traiguén, and was accused of illicit terrorist association in 2003. He was left under cautionary restrictions, and failed to appear in court in 2005. In January 2001, he was sentenced for an arson assault in an estate in the Lleu-Lleu area, to 541 days in prison. He was later accused of being the author of an attempted homicide against Antonio Boiser, owner of the estate, whom lost an eye in the attack, in 2002. Rosende assured that “today we are happy with the result and we wish to congratulate Investigations Police and the Prosecution.” In the same way, he stated that the leader of the CAM “had turned himself over voluntarily.” With the arrest of Llaitul, the CAM takes a hard hit, since all of its leaders are either in jail or are clandestine.